HALLIE EPHRON: When we lived in New York City on the Upper West Side there were a ton of Cuban restaurants. That's where I developed a taste for "maduros" – sweet plantains that have been caramelized in hot oil and served as a side dish with just about any kind of meat, fish or chicken. Now I live in a part of Massachusetts where Latin restaurants are few and far between, but happily my local supermarket carries plantains. First, recognize them in the store. They're not bananas. They're bigger, cheaper, and like bananas they start out green and turn yellow and then turn black. When they're green, they're called platanos verdes or unripe plantains (green). They can be sliced thin and fried. You might recognize them as tostones. They taste a bit like French-fries. They need salt and to my taste, they're okay. But buy green ones and keep them for a week or two on a kitchen counter and they ripen and turn black. They've turned into platanos maduros and they're sublime. Like a fried banana only far better. 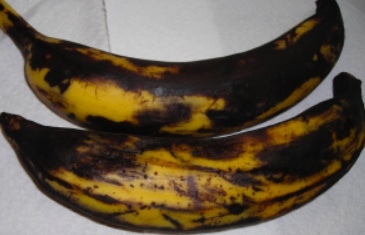 Peeling a ripe plantain is tricky. The skin doesn't want to just slip off the way it does on a banana. It helps if you make a shallow slits into the skin the long way, from tip to tip, then peel. Heat butter and oil in a heavy frying pan and sauté in a single layer over medium heat until both sides are nicely browned. Drain on a paper bag. That's it. They're delicious, and the perfect substitute for potatoes or rice when you're in the mood for something a little different. I’ve never tried this before, Hallie, but it sounds [and looks] delicious. I’m definitely stopping by the grocery store for some plantains. Thanks for sharing this . . . .
Hallie, I only ate Cuban food in Southern California and Florida. Cuban restaurants (and ingredients) are pretty scarce in Ontario but I could probably find green plantains here. Looks like carmelized yumminess. I've eaten plantains like this going way back to when I was an exchange student in Brazil in 1970, but never I've cooked them. I feel a South America dinner coming on! Oh, I love fried plantains! So good! Thanks for reminding me about these, Hallie. I haven't made the plantains much since they all flew the coop; Steve is not as adventurous about food as the rest of us. But they were one of my favorites. You think they'll taste sweet, but they have more of a umame, meaty flavor. More like meat than fruit, anyway. I draw the line at durian. I had to go google durian! I've seen them but never knew the name. So funny. Last year I grabbed a couple of bananas and tossed them in my cart. They were the worst things ever. It took me about a week to realize I'd bought plantains, which someone had put in with the real bananas. I gave the remaining one to our Puerto Rican housekeeper. I've had plantains a few times, found them okay but not something I crave. Maybe I ought to try cooking my own. Also, do you pronounce them to rhyme with remains or matins? I learned the latter, as if they were spelled plantins. I'm very adventurous with food, and the only thing I refuse to eat -- so far -- is cilantro. Our Wegman's has a large selection of exotic fruit, expensive tho. Once in a while a treat myself to dragon fruit, so beautiful that it's hard to break down and eat it but will worth the price. My favorite exotic fruit: passion fruit or Maracuyá - looks like miniature grapefruit, cut it open and it's full of juicy seeds which you scoop out and eat with a spoon. Toss the rest. And I love cilantro - I buy it by the bunch and sprinkle liberally over chili, or chicken and rice, or chicken noodle soup... I gather some people have a gene that makes it taste chemical/perfumey. Hallie, I love cilantro, too, and Rick hates it. So I can't put in in things but I sprinkle it on top of my food. Weirdly, my daughter feels the same way about parsley--she can't stand it. Would there be Portuguese restaurants in Massachusetts? I remember there is a Portuguese community in Massachusetts or is it only on Martha's Vineyard? There's Casa Portugal, been there for decades in Cambridge. (Pork and clams is one of my favorite Portuguese dishes, served with their wonderful crispy potatoes) And of course a ton of them in Fall River. Fishing community. I've had a version of it at the home of someone of Cuban descent, and it was delicious! Since then, I have wanted to try cooking some at home myself. Thanks for the recipe! Hallie, thanks for this. So interesting. As many exotic things as I ate in Mexico over the years, I don't think I've ever had plantains. I'm going to look in my supermarkets for them now! I love cilantro! At one time I grew it but then my ten gray thumbs took over. Yum! I haven't made these at home though I've had plantains in the Caribbean. I'm definitely going to hit up my fruit guy for some of these! Here they're often priced at 4 for a dollar. What else can you get for a quarter? What's cooking there in your skillet looks delicious, Hallie. I know I've had plantains before, but I don't think they were fixed as well as yours. Let's hear it for cast-iron skillets! I've had fried plantains in Central America, and here in Houston restaurants. Delicious! I love plantains! There's a crazy decadent Chicago Puerto Rican dish called jibarito, which is basically a steak sandwich that uses fried plantains instead of bread. It has lettuce, tomato, and a garlic sauce as well, and is so delicious.